If you’re looking for a piping system specifically designed for the use of compressed air, then be sure to check out the aluminium compressed air pipe range from Air Energy, your trusted air pipe supplier. Light and strong, and making for a highly appealing installation, our aluminium powder coated blue pipework delivers high performance no matter what the application. Installation of our aluminium pipework is fast, secure and easy, with special aluminium pipes and fittings replacing the need for traditional welding. The tubes are internally coated with polymer corrosion protection which helps to enhance the system’s performance. Air Energy stocks top brands of aluminium compressed air pipes and pipe fittings – Vastair, Airnet, Transair and Unipipe. At Air Energy, we look to quality when it comes to providing you with the best aluminium pipes and fittings in the market. We only sell and install world-renowned brands that guarantee a long service life and provide your facility with an energy-efficient system. 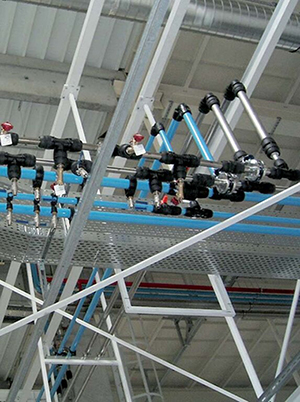 Unipipe’s aluminium pipe press fittings are designed for fast and easy installation, with a high level of durability. When used for high or low compressed air applications, the Unipipe system is capable of withstanding temperatures ranging from -20°C to 100°C. Besides compressed air processes, the pipe system is also suitable for fire protection, industrial gases, and high-pressure oil and water lines. The brand’s compressed air pipe systems are quick to install and ready for immediate pressurisation. This gives you significant savings on installation, maintenance and operating costs. The inner pipe surface of the Vastair aluminium pipe delivers clean compressed air, which ensures that the pipe is resistant to corrosion. The sealing characteristics, low friction coefficient and the design of the Vastair components ensure the constant flow of clean air. AIRnet is Atlas Copco’s lightweight, versatile, corrosion-resistant aluminium system. This premium quality pipe system is suitable for compressed air, vacuum and inert gases. The inner portion of the AIRnet pipe is coated for enhanced corrosion protection and lower friction loss. Painting the pipe is not necessary as the system comes pre-painted blue to comply with Australian regulations. The Airnet aluminium system also comes in green for inert gases. Transair compressed air pipe system is incredibly easy to install and also has a high level of resistance to corrosive substances, mechanical shocks and drastic changes in temperature. The Transair compressed air pipe system is cost-effective, which enables you to minimise plant energy costs by eliminating air leaks, lowering the number of pressure drops and improving the efficiency of the air pipe system. 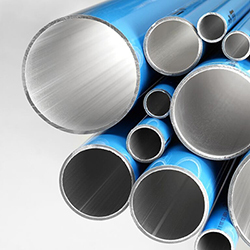 Discover why you should always opt for aluminium over PVC piping systems. There are many advantages to installing an aluminium compressed air pipe system over a steel or PVC system. In fact, although it is a reliable material for many applications, PVC should never be used for compressed air. The compressed air causes it to degrade and become brittle and PVC could explode in a hail of jagged plastic shrapnel. In systems channelling large volumes of compressed air, the added presence of compressor oils, heat and high pressure can turn PVC into a significant OSHA risk. If ruptured, PVC pipes may fail catastrophically and can injure workers and damage equipment. Aluminium is less prone to high pressure system leaks. An aluminium compressed air pipe system does not require the parts to be threaded in order for the pipes to be connected, which means that it takes far less time – and therefore less cost – to install. Most importantly, it is corrosion resistant which means it won’t rust and therefore pollute clean air travelling through the pipes. The system will also minimise air pressure drop, which saves on power costs as air won’t be forced to work harder due to loose scale deposits that build up over time in galvanised or even copper pipes during the corrosion process. If you would like to speak to an experienced professional about installing an aluminium compressed air pipe system on your worksite, or would like someone to examine your existing system, contact us and give us a call today on (03) 9765 5600.